I absolutely love this lipstick. The colors are so cute and it smells yummy too! Love their lipsticks and it's really inexpensive. Love all things Milani. Especially the liquid liner. But this product has to be one of my favourites. They come in a variety of fun and pigmented colours that give my outfits a "pop." They're a really nice wow factor. I like to apply lipstick with a brush, and it comes on easily onto the brush, which I've had bad experiences with drug store make up. Definitely would recommend. Milani lipstick looks very nice when first put on, but quickly fades, requiring frequent reaplication. However, it does not dry out lips, nor leave a stain after removal. Overall, the product is average, but no worse than many other lipsticks on the market. 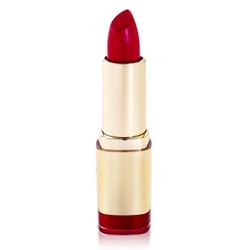 This is a very nice lipstick that comes in handy. I lost my Mac Red and this was close enough to the color I wanted, and it lasted a while. I stains the lips so i would deff buy it again.